For 15 years the Emerald Cup has been showcasing Northern California’s premier cannabis destination while advancing the concept of sustainable, outdoor farming. Its reputation is firmly solidified as the largest, most respected, organic, outdoor, cannabis competition in the world. In this editorial series, DCN had the opportunity to speak with each of the first place winners to showcase who they are, their mission and what it takes to compete in one of the industries most respected cannabis events. Sun Roots Farm is a small family run homestead in Mendocino County specializing in food and medicine. 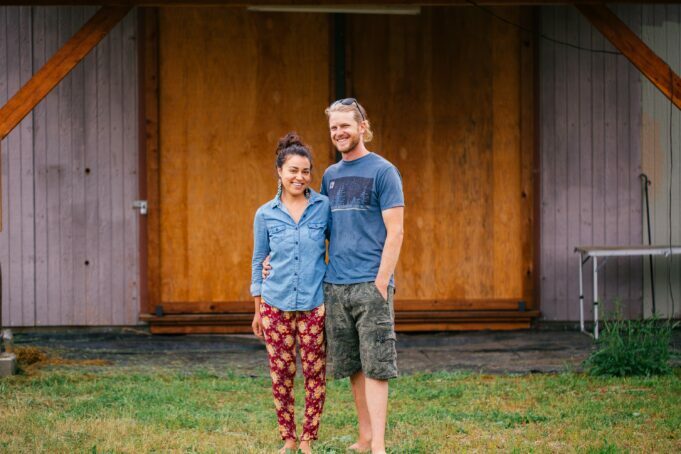 Established in 2015 by Forrest Gauder and Patricia Vargas our belief is that, when the land thrives, we all thrive. The farm serves as a place of learning and reconnection to our greatest teacher, the Earth. DCN: What is the mission statement behind Sun Roots? Sun Roots: At Sun Roots Farm our mission is to expand the awareness of healthy, pure, and sustainable living. DCN: Sun Roots was recognized and won the Regenerative Farm Award at the Emerald Cup this past winter! How does it feel? Sun Roots: We feel deeply honored. This is a profound mission we are on to save the planet! New agricultural methods using regenerative practices are one of our last methods for this mission to succeed. We feel it is our responsibility to create momentum and foster educational sharing among cannabis and farming communities on how to grow with integrity and effectiveness for the farmer, the land, and the product. DCN: How long has Sun Roots Farms been around? Sun Roots: The farm became official in 2015 but we have both been homesteading since we were children – Forrest, co-owner has been living here since birth and has always had cannabis as part of his life as a second generation farmer/homesteader. Forrest and Patricia first collaborated to make gardens and medicine in 2014. DCN: Why is regenerative farming important to Sun Roots? Sun Roots: This method of agriculture is absolutely critical to the survival of all beings. From pollinators to clean water, from soil microbes to universal awakening consciousness, we feel it is all connected and we take our mission on this Earth very seriously. The world has a massive force of pressure that is affecting each of us, whether we choose to recognize it or not. Our lifestyles, our choices, our farms, our food, and so much more need to be regenerative. Without moving forward in this direction, our lives are in jeopardy. The fast-paced human race has already taken away everything from other plant and animal species, degraded earth elements such as water, air, soil and more. The planet has reached a point of maximum stress and yet we continue making the decisions that push us further into this negative state, without giving back. The time is now to make daily decisions that do good for the environment and ourselves and we support change in every way from our land to societal and cultural norms. DCN: In what ways does Sun Roots incorporate regenerative farming? Sun Roots: This farm has vegetable, herbal, fruit, fungi, native medicinal and perennial gardens that welcome a large biodiversity to the land. The farm works with and listens to nature constantly attempting to restore and give back to Earth. The use of biodynamic practices also allows vital life forces within, above, below and throughout the farm. Agricultural practices include closed loop systems, water conservation, wildlife sanctuaries, companion planting, intercropping, permaculture, polyculture, fire safety, no-till, using local resources, bee-keeping, composting, raising animals mindfully, fermentation and inoculation of natural fertilizers, hügelkultur beds, sheet mulching, and a commitment to incorporating sustainable living techniques into daily existence. DCN: What does Sun Roots have in store for 2019? Sun Roots: Sun Roots is spreading its roots! Literally, our connection web is growing. We have become part of an international group of growers called The Pure Collective™ founded by DEM Pure Farmers. We are actively working towards putting together workshops and free information for the cannabis community this year. We have quite a few events and workshops lined up already and have also created some video media content that we are sharing freely to the public. Our goals this year on the land are to create more efficiency in any places we can improve, and otherwise to open up our connections with other like-minded businesses that support EARTH, as well as underrepresented communities and peoples. DCN: Why will practices like regenerative farming be so important under the new regulatory landscape? Sun Roots: Working constantly to restore and give back to the ecosystem, rather than employing depleting and unsustainable farming practices, is the only way we can begin to reverse the huge mistakes made by humankind on our planet. Currently, big AG practices are proven to be harming a multitude of layers in the food web. Pollinators such as honey bees and butterflies (and so much more!) are unable to thrive in environments created by big AG. Toxins are found everywhere, the air, the deepest waters, the soil, humans, animals, plants that are being poisoned by these unethical agricultural practices. We must practice regenerative farming on a collective scale to make a difference – from our home gardens to larger product suppliers. We must say no to corporate food and medicine, no to pesticides, fungicides, and all the other toxins that are so inevitably ingrained our daily existence. Regenerative farming is diverse and giving – it provides abundant products in a sustainable form. We need to take back control of ourselves and our incredible paradise of a planet. How we choose to live, what we choose to purchase, and what we choose to eat should be secured in health and wellness – not the opposite. The planet and its inhabitants are suffering for no reason – we need to collectively nurture the environment within and around us. DCN: DCN is a business to business digital news network, giving a voice to cannabis startups, and sharing the stories of entrepreneurs in this industry, we may be business focused media outlet but one thing we strive is to make sure that as the cannabis community evolves into an industry, we don’t want to lose the WHY we are all here and that is because of this plant, what is one important message you would like to share to our readers? Sun Roots: KEEP CANNABIS SACRED. VOTE WITH YOUR DOLLAR. SUPPORT SMALL FARMS. BAN CORPORATE FOOD AND MEDICINE. GET INVOLVED. USE YOUR VOICE. DIG YOUR HANDS INTO THE EARTH AND START THE CHANGE. DCN: Thank you for taking the time to share more about Sun Roots. Congratulations again! Before we let you go is there anything else you would like to share with our readers? Sun Roots: Together we can make a difference – let’s get on the same page. To learn more about Sun Roots, visit www.sunrootsfarm.com. Stay tuned for our next Emerald Cup Spotlight.